Ankara ordered an Armenian plane to land in the city of Erzurum for inspection before allowing it to leave Turkish air space Monday. 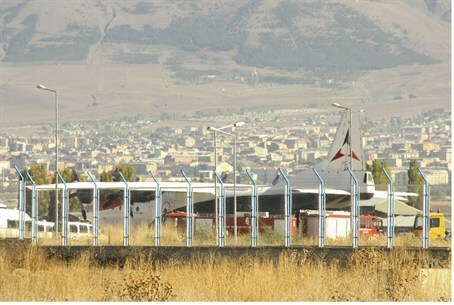 Ankara ordered an Armenian plane to land in the city of Erzurum for inspection before allowing it to leave Turkish air space Monday. The Air Armenia cargo plane was headed to the northern Syrian city of Aleppo. It was the second plane to be forced to land on Turkish soil in less than a week. But both countries confirmed the plane was carrying humanitarian aid as part of a campaign called "Help a Brother." Among the items aboard the flight were foodstuffs such as buckwheat, rice, sugar and pasta, according to Armenian Dashnaktsutiun party lawmaker Vahan Hovannisian. There is a small Armenian community in Syria numbering between 60,000 to 100,000 people, with most living in Aleppo. Although no diplomatic ties exist between Turkey and Armenia, and their border has been closed for more than a decade, the plane's landing was pre-arranged, AFP reported, quoting Armenian officials. A Turkish foreign ministry official told the news agency the flight was required to stop over in Turkey for routine security checks on its cargo. It was released for departure following the inspection, which found nothing unusual, according to Turkey's state Anatolia news agency. "We know a plane from Armenia was forced to land in (eastern) Erzurum city but it was allowed to resume its journey," Deputy Prime Minister Bulent Arinc was quoted as saying. The plane's cargo matched the manifest filed by crew members prior to the flight, Arinc said. He added that the security check showed "how well Turkey performed its duty." Last week Turkey scrambled two F-16 fighter jets to force down a commercial airliner flying from Moscow to Damascus. The passenger flight was escorted to Esenbogen airport in Ankara after Turkey received a tip from the United States the plane was carrying non-commercial cargo. Media later reported the plane may have been carrying missile parts, communications gear and other military items. Russia vigorously denied the flight had carried anything other than civilian cargo from its territory. Syria claimed Turkish officials had lied about what they found. The flight was allowed to continue on to Damascus after the suspect cargo was removed. In response, Syrian subsequently closed its air space to Turkish aircraft, and Turkey did the same with Syrian flights.